The Community Installer(Free_Marketplace) is a free marketplace developed by independent SmartThings Developers to bring a market place to life to allow for simple 'one-click' installation of a variety of community-developed SmartApps and Devices. 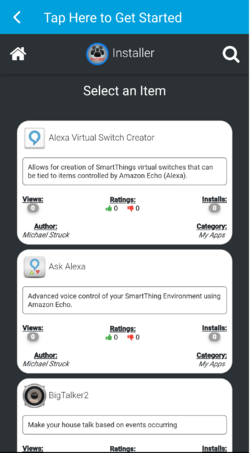 This range from the home voice control of Ask Alexa () to the wildly popular rule-based automation engine WebCoRE (). 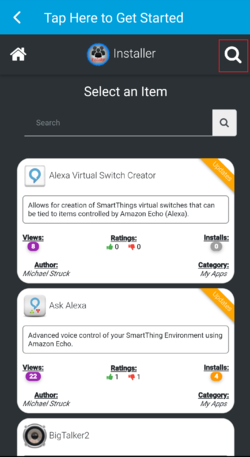 Community Installer (Free Marketplace) uses the SmartApp to act as a web service to automate the setup of various developers' SmartApps. At no time is any information about your personal SmartThings account, devices, or settings uploaded to the external web service. 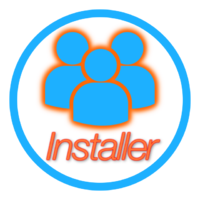 The authors of this installer application are NOT responsible for any SmartApp and/or Devices displayed in the Community Installer (Free Marketplace). Any SmartApp or device appearing in the Community Installer (Free Marketplace) will always be the responsibility of the individual developer. Further, the authors of this application will not be responsible for any damages obtained to yourself or your belongings while using Community Installer (Free Marketplace). Use Community Installer (Free Marketplace) at your own risk! Once you have integration, the code you need will be available to you to download and keep in sync with the latest versions. Community Installer (Free Marketplace) requires OAuth be enabled. 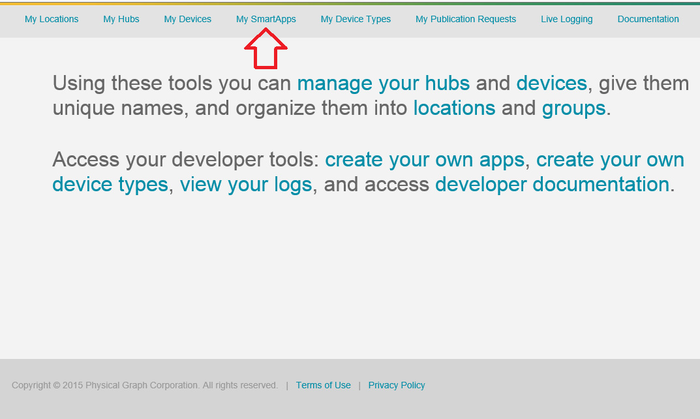 To enable OAuth, first find and click the App Settings button in the upper right corner of the SmartThings IDE. You must open the Community Installer (Free Marketplace) code to find this button. Clicking the OAuth link will reveal a button labeled Enable OAuth in Smart App. Click this button. The screen will change, giving you a unique code for your Client ID and Client Secret. These are the foundations of the security of your app and should be kept secret. You do not need to memorize or write down these codes; nor do you need to add any other information to this page. 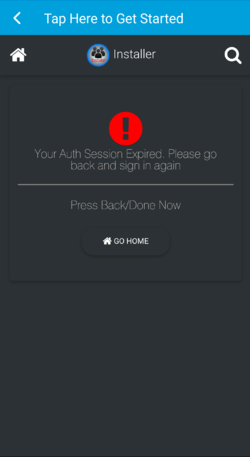 OAuth simply needs to be enabled for Community Installer (Free Marketplace) to operate. 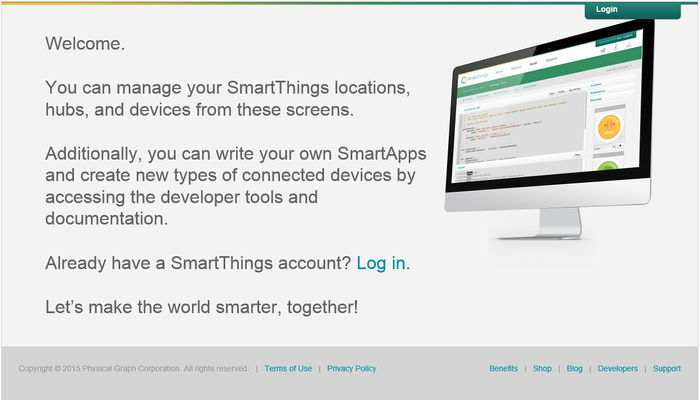 On this page you will be required to choose your specific login to the SmartThings environment. Valid choices are either SmartThings or Samsung. 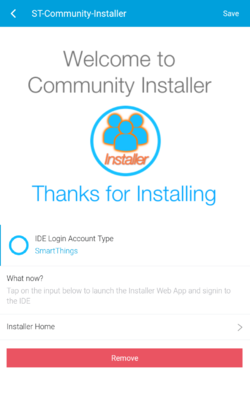 Once selected, tap <<Installer Home>>> and you will be prompted to login to the SmartThings. HTML page custom to you. From the home page, each application is listed with the name, the number of registered installs (from the installer) along with a cumulative rating from users across the SmartThings eco-system. 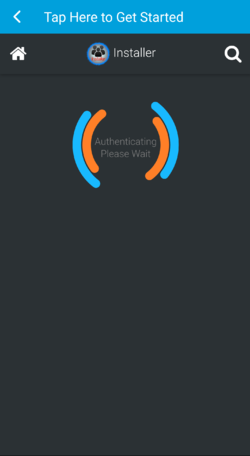 You may also see a banner on the applications indicating whether the SmartApp or device has been installed or if an upgrade is available. 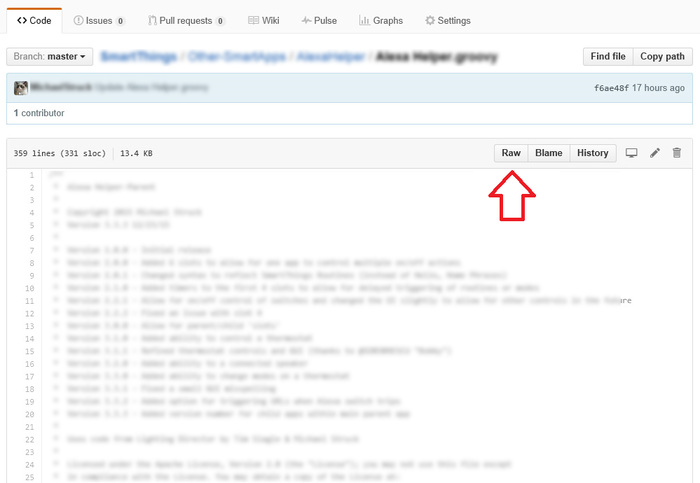 Also included on the web page is a search feature. Use this area to search for specific programs or device type handlers (DTHs) that you are looking for. 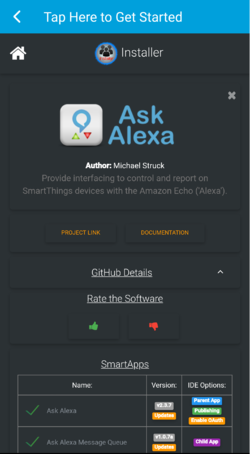 Tapping on any of the application boxes in the list on the home page will bring additional information about the application, including the author, project links, and even documentation and the GitHub information. In addition, you can rank the application. 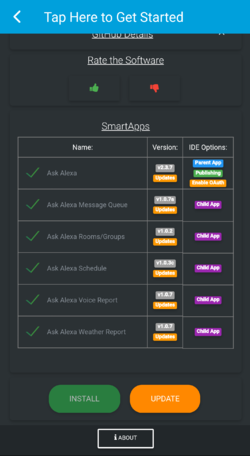 As you scroll down through the information you will also see information about individual components of the Smartapp, their version numbers, and the ability to select or deselect optional items to install. At the bottom of the information page for each application you will have the ability to install the application. 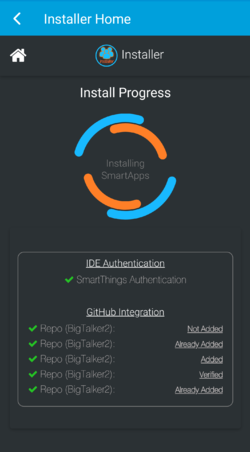 In addition, if you already have a listed application installed and an upgrade is available, you will be given the ability to upgrade your code in your SmartThings IDE automatically using the installer. 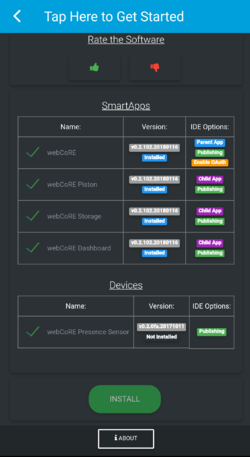 The installation will handle adding the SmartApp and/or devices to your SmartThings IDE, and even add the links (if available) to sync the developer's GitHub with your SmartThings IDE. Finally, if the application required OAuth to be enabled the installer will do that as well as publishing the application (it the author deemed it necessary). Security is at the backbone of the Community Installer (Free Marketplace). 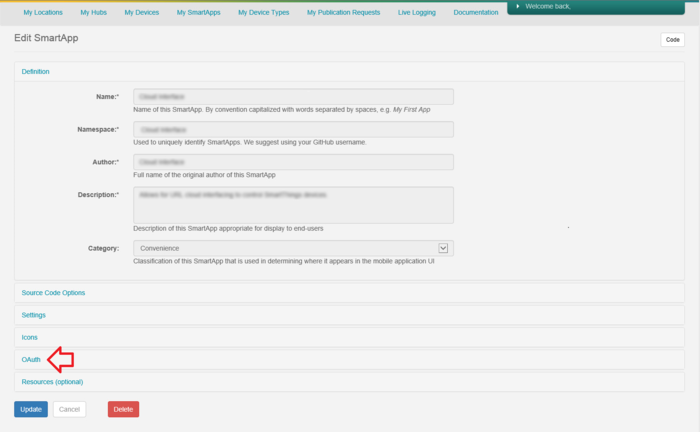 While you are required to log in to SmartThings to integrate this program, no information about your account or IDE is revealed to anyone. In addition if you leave your the Community Installer (Free Marketplace) open and go to other screens on your mobile device you may be required to refresh the page or even log back in. This is to ensure the security of your environment. To maintain integrity of the marketplace, developers can not post directly to Community Installer (Free Marketplace). Instead, the list of available applications is maintained by a small group of individuals (including the author of this application). This prevents rouge applications from being place into your IDE. The developers must fill out a JSON manifest that allows the installer to present the necessary information to the users. This page was last edited on 9 March 2018, at 10:51.